This hard hitting book focuses on proactive leadership skills and techniques that will prevent unethical situations from arising and becoming damaging to a project. This is in contrast to a discussion on how to reactively deal with unethical issues after they have already occurred. A heavy emphasis is placed on the topics of leadership and ethics as they relate to the management of major construction projects. This book absolutely does not simply explain what common unethical acts are, as this would be stating the obvious. This book elaborates to provide management techniques that can be implemented to ensure each member of the project team is performing their individual role in a competent and ethical manner. This elaboration on proven management techniques is what makes this book truly valuable. The advice, examples and lessons learned contained in this book have been attained from a long, storied and successful career in the construction industry. • Learn how to manage and lead a project team in a manner that ensures every individual team member is performing their job in an ethical manner. • Understand the personal accountability we all have for every decision we make. • Learn how to handle the situation when faced with an ethical dilemma or when directed to perform an unethical act by your superior. • The primary focus is on financial matters, such as bidding, subcontract negotiations and change order issues. You will walk away with a better understanding of how to handle these situations fairly and ethically, as well as what to do when faced with an ethical dilemma. A single mistake, whether made during the bidding process or when executing a construction project, can potentially cost tens of thousands of dollars or more. Of course, the sooner mistakes are caught, the less costly they become. Based on the authors’ combined experience working on projects large and small, this book delineates how project teams can avoid mistakes and run projects more intelligently, effectively, and efficiently. 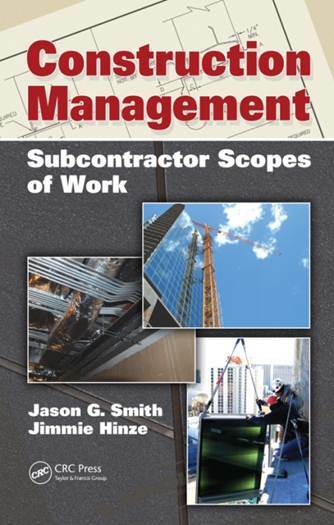 • Gain a solid applied knowledge of the intricacies of each subcontractor's scope of work and how to avoid common problems, aka "scope busts". • Learn the intricacies of the bidding process for each of the individual building trades. • The examples in this course have been specifically designed to provide the attendees with a good working knowledge. Specifically, the attendees will gain a good understanding of how the work of a project is delineated among the myriad of subcontractors. • Learn to be a more knowledgeable and collaborative partner with the general contractor throughout the bidding process. Usually ships within 5 working days. For further discounted bulk sales, to pay by check or if you have any other questions please feel free to contact us at Sales@ConTrainOrg.com. You will be directed to a safe and secure website to purchase this book with a debit or credit card. Constructability is as important to a construction project as water is to a fish. This book helps architects and engineers gain a greater understanding of what information the contractor needs for both the bidding and construction phases of a project and, even more importantly, why they need this information. Our discussions throughout this book will skip right past the basics of design document preparation and proceed directly to the many intricacies of a project design that are not intuitive or otherwise easily overlooked during the design phase of a project. The discussions throughout this book present an in depth examination of how to efficiently and effectively prepare design documents to ensure the general contractor, subcontractors, manufacturers, suppliers and all other project team members clearly understand their roles for the project. Through a series of examples that are derived from extensive field experience a greater understanding of why the general contractor and their team of subcontractors require certain information for both bidding and construction purposes is provided. This book examines the intricacies of how the design documents can be developed to ensure accurate bids are attained, change order issues are minimized and the overall quality of the project is maximized. 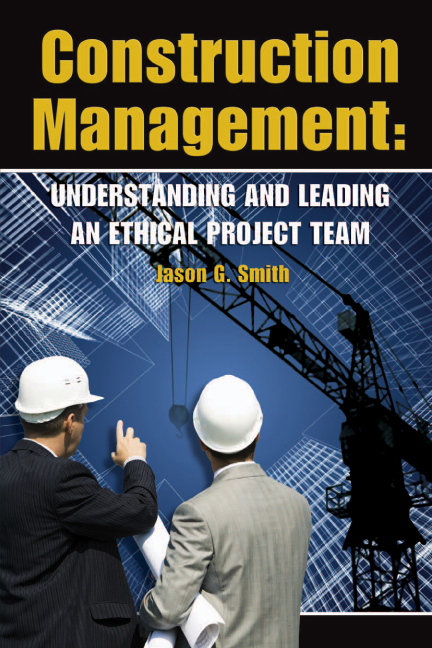 ​• First and foremost, this book helps project teams prevent problems from occurring. 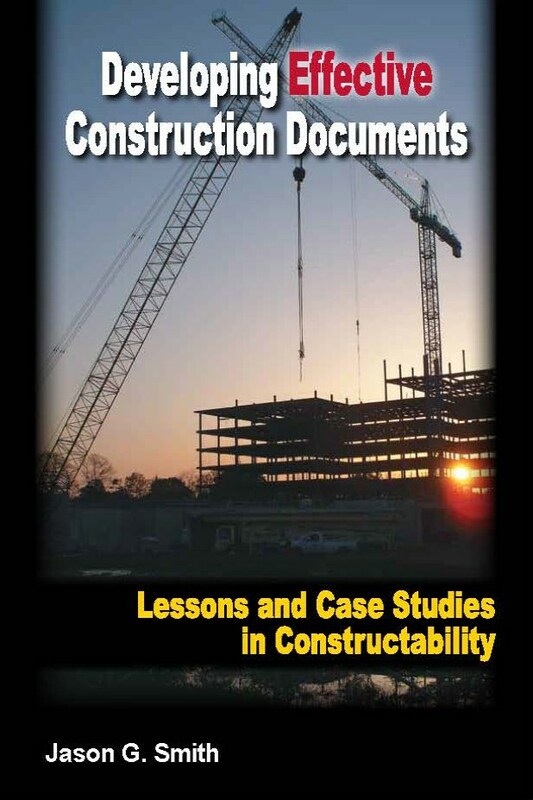 • Gain a solid understanding of how construction documents should be prepared to ensure subcontractors have the necessary direction to construct the project efficiently, effectively and of the highest quality possible. • Learn what information the design documents must contain for both bidding and construction purposes. • The examples in this book have been specifically designed to provide the reader with a good working knowledge. Already Acquired By Over 60 CM Programs! Jason G. Smith is an AIA CES Approved Provider and is available for live presentations ! ​The cost for live classes varies by location, so please contact The CTO at 310-998-7781 or Admin@ConTrainOrg.com for pricing. This hard hitting course focuses on proactive leadership skills and techniques that will prevent unethical situations from arising and becoming damaging to a project. This is in contrast to a discussion on how to reactively deal with unethical issues after they have already occurred. A heavy emphasis is placed on the topics of leadership and ethics as they relate to the management of major construction projects. This course absolutely does not simply explain what common unethical acts are, as this would be stating the obvious. This course elaborates to provide management techniques that can be implemented to ensure each member of the project team is performing their individual role in a competent and ethical manner. This elaboration on proven management techniques is what makes this book truly valuable. The advice, examples and lessons learned presented in this course have been attained from a long, storied and successful career in the construction industry. • Attendees will learn how to handle the situation when faced with an ethical dilemma or when directed to perform an unethical act by their superior. • The primary focus is on financial matters, such as bidding, subcontract negotiations and change order issues. Attendees will walk away with a better understanding of how to handle these situations fairly and ethically, as well as what to do when faced with an ethical dilemma. This course provides attendees with a solid understanding of the Constructability Review Process. Including 1) Where to start, 2) How to go about the process, 3) What level of detail to get into for preliminary reviews (like 100% DD's and 50% CD's), 4) How to organize the comments and 5) Very importantly, how to manage the process to ensure all comments are adequately addressed by the Design Team. • Understand how to go about the process of a Constructability Review efficiently, effectively and in a manner that will enhance, not inhibit, the design team's workflow. • Learn the appropriate level of detail for preliminary reviews (such as DD's and 50% CD's) to ensure the design team receives helpful comments, not long lists of things that just aren't done yet. • Learn how to organize and manage the comments such to ensure they are all adequately addressed by the Design Team. • Learn the additional benefits to a thorough Constructability Review. There are many additional benefits that can be taken advantage of with very little additional effort. This course provides attendees with a solid understanding of the Exterior Skin Coordination Process. Including 1) Why the General Contractor, not the Architect, leads this effort, 2) How to go about the process, 3) What level of detail is necessary for a comprehensive coordination effort, 4) How to prepare and organize the details and 5) How to manage the Subcontractors. • Clearly understand what Exterior Skin Coordination is all about, why the General Contractor takes the lead and where to begin. • Learn how to Lead a thorough Exterior Skin Coordination Effort, while efficiently and effectively managing the Subcontractors. • Recognize what details do or do not need to be included in the Exterior Skin Coordination Plan, and why. • Learn the nuts and bolts of how to coordinate Exterior Skin Details. • First and foremost, this course helps project teams identify and solve problems before they occur. • Learn the intricacies of the individual building trades and understand how to prepare the construction documents such that all subcontractors and other project team members can complete their work efficiently and effectively. • The examples in this course have been specifically designed to provide the attendees with a good working knowledge of the Structural Concrete, Mass Excavation and Site Work trades, as well as general (bigger picture) design considerations. • The examples in this course have been specifically designed to provide the attendees with a good working knowledge of the Structural Concrete, Mass Excavation and Site Work trades. Specifically, the attendees will gain a good understanding of how the work of a project is delineated among the myriad of subcontractors. In this course you will learn how to develop and execute and efficient and effective Quality Control Program that you, and the rest of the project team, will utilize on a routine basis. Quality Control Programs are commonly regarded as administrative exercises meant to fulfill a boilerplate contract requirement. Project QC Programs are often found to be big thick binder full of boilerplate marketing jargon that, after completed, are placed on a shelf in the Project Managers often and never opened again. With the knowledge gained in this short course you will have the ability to prepare an efficient and effective quality control program that itemizes and cross references every odd, end, nook and cranny of a project. Your QC Program will become your go-to management reference tool. • Learn what information should be included in a quality control program, and why. • Understand how to organize quality control concerns into an easy to prepare and use matrix. • Learn how to create a QC matrix that can be easily sorted by subcontractor, phase and area. This knowledge base in matrix form will become one of your most important management tools. • Learn how an effective QC Program, not a QC binder full of boilerplate information, can truly benefit a project. This hard hitting video focuses on Proactive Leadership Skills and Techniques that will prevent unethical situations from arising and becoming damaging to a project. This is in contrast to a discussion on how to reactively deal with unethical issues after they have already occurred. A heavy emphasis is placed on the topics of leadership and ethics as they relate to the management of major construction projects. This video absolutely does not simply explain what common unethical acts are, as this would be stating the obvious. This video elaborates to provide management techniques that can be implemented to ensure each member of the project team is performing their individual role in a competent and ethical manner. This elaboration on proven management techniques is what makes this video truly valuable. The advice, examples and lessons learned contained in this video have been attained from a long, storied and successful career in the construction industry. • This video can be viewed as a stand-alone teaching tool, or used to supplement a live class. • The viewers will learn how to manage and lead a project team in a manner that ensures every individual team member is performing their job in an ethical manner. • Viewers will also understand the personal accountability we all have for every decision we make. • This video provides a series of real-life examples and proven management techniques, not theoretical discussions. You will be directed to a safe and secure website to purchase this video with a debit or credit card. Within two business days after purchase you will receive a link to download your copy of the video. Each video is customized to reflect the licensing of the product to the purchaser, or the purchaser's company. Video pricing reflects permission for one person, or one instructor and their class. If you would like to use the videos for multiple classes (such as a University Department) or for use company-wide (such as a company's internal intranet site) please contact us for pricing at 310-998-7781 or Sales@ConTrainOrg.com. There is a slight upcharge for wider scale usage. FOR A LIMITED TIME THE CTO IS OFFERING SPECIAL PRICING OF $449.00 FOR COPYRIGHT PERMISSION OF THE FULL VIDEO FOR AN ENTIRE UNIVERSITY DEPARTMENT! Please contact us at 310-998-7781 or Admin@ConTrainOrg.com for this special offer. Each video is customized to reflect the licensing of the product to the purchaser, or the purchaser's company. Video pricing reflects permission for one person, or one instructor and their class. If you would like to use the video for multiple classes (such as a University Department) or for use company-wide (such as a company's internal intranet site) please contact us for pricing at 310-998-7781 or Sales@ConTrainOrg.com. There is a slight upcharge for wider scale usage. This course provides learners with a solid understanding of the Constructability Review Process. Including 1) Where to start, 2) How to go about the process, 3) What level of detail to get into for preliminary reviews (like 100% DD's and 50% CD's), 4) How to organize the comments and 5) Very importantly, how to manage the process to ensure all comments are adequately addressed by the Design Team. Through a series of many-many examples, this course provides participants with a solid understanding of the Exterior Skin Coordination Process. Including 1) Why the General Contractor, not the Architect, leads this effort, 2) How to go about the process, 3) What level of detail is necessary for a comprehensive coordination effort, 4) How to prepare and organize the details and 5) How to manage the Subcontractors. • The examples in this course have been specifically designed to provide the learners with a good working knowledge of the various construction trades. • The learners will gain a good understanding of how the work of a project is delineated among the myriad of subcontractors. Learn to clearly communicate the justification of a change order request to ensure full and timely payment. This course provides learners with a good understanding of the change order process, roles of the various parties and methods of ensuring a Subcontractor's change order requests move as smoothly as possible through the process. Cash flow is crucial to a business, so getting paid for change order work in a timely manner is of the utmost importance to a companies financial health. The examples, case studies and lessons learned provided in this course are invaluable to managers of all sorts in the construction industry. • Understand how the change order process works and why approvals take so long. • Learn how to write good descriptions and prepare the COR's in manners that will expedite the approval process. • Learn how to navigate the common pitfalls of the COR approval process. • Gain a better understanding of the roles the Subcontractors, GC, CM and Owner play in the approval process. This first part of the course helps project engineers understand the importance of the RFI and Submittal processes, as well as how to go about them with high degrees of proficiency and efficiency. The second part of this course addresses the various logs we need to track embeds, backing, permits and many of the other loose ends of a project. This second part provides advice that improves the organization of these administrative tasks and makes them less time consuming. The third part of this series focuses on quality control programs that truly work. 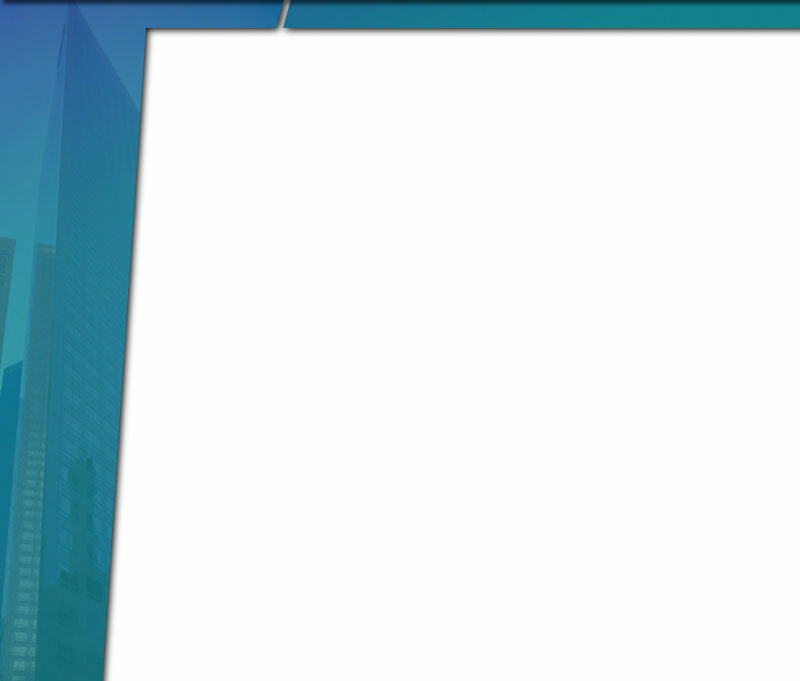 In this industry quality control programs are commonly just binders that sit on a shelf collecting dust. The final segment of this course teaches how to develop and maintain a quality control program that is truly useful on a daily basis. • The younger builders will develop a better understanding of the importance of project administration and how to lead the subcontractors. • Learn to be more organized with the various project administration tasks and how this organization will make you a more effective leader. • Learn how to efficiently keep track of the countless loose ends on a project. • Learn how a well developed and maintained quality control program can greatly improve subcontractor coordination and project execution.